Ben Sinclair talking about the wonderful piece of artwork that he did for Watcher. Recently, I have been spending a lot of my time on this piece, which is an illustration for a fellow blogger on WordPress. 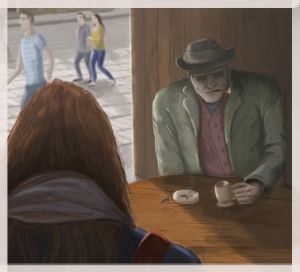 It depicts a mysterious character called the Watcher and gives an image for a very short story. This was done digitally and I had fun focusing on the lighting, which creates a dramatic effect to make the Watcher seem more mysterious. The bright sunlight casts a shadow over him, causing him to have very dull colours, compared to the surrounding brighter colours. It was also interesting to experiment with the blur tool in photoshop, to blur out the background and bring more focus into the main character, much like a camera would.